I finally had the chance to read the brand new Dr. Seuss picture book this weekend. As with most Dr. Seuss fans, I was thrilled to hear the news of its release, waited impatiently on reserve lists, and finally just snagged a copy at Target so I could read the story inside. Dr. Seuss' trademark rhyme scheme and illustrations are spot-on. A young brother and sister visit their local pet score with their parents' admonition that they be back by noon with just one new pet. Overwhelmed at all of the possibilities, each child has a difficult time deciding just what to take home and wishes they could take them all home. They debate the pros and cons of their choices, dream up imaginary pets and how their parents might let them bring home more than just one, but eventually a decision is made. 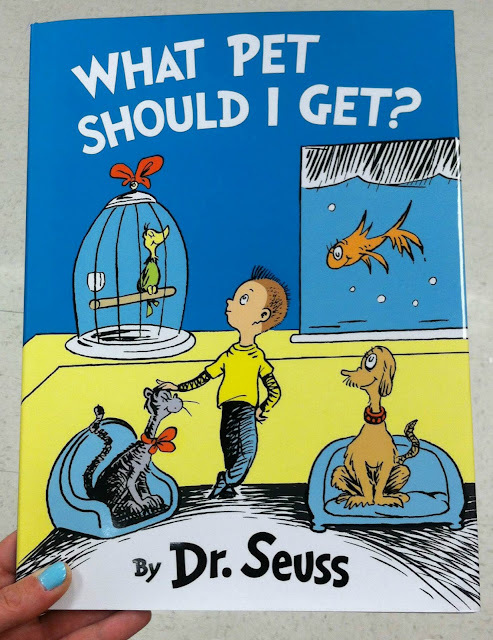 Shorter than most narrative Dr. Seuss picture books, What Pet Should I Get? feels like it still was in the development stage when its author laid it aside. This is perhaps most strongly felt in the book's ending, which felt like a little bit of let-down compared to most traditional Dr. Seuss book endings. That being said, the illustrations are bright and colorful, the rhymes are young-reader friendly, the book has a sweet message about the joys of pet ownership, and who doesn't love having another Dr. Seuss book to join their bookshelf?